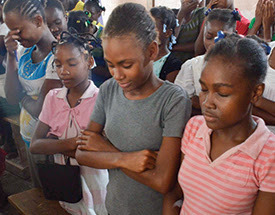 Heavenly Father, we join Compassion International in praying for the children of Haiti. After weeks of anti-government protests and riots, we are thankful that things are stabilizing in Haiti and that Compassion offices and centers have been able to reopen. We pray that Compassion’s church workers and students will be able to quickly reconnect, and that workers will be able to assess what the children’s needs might be after this period of unrest in the nation. We pray specifically for children and family members who have been injured, burglarized or displaced from their homes. We also pray for restoration of both peace and the property that has been damaged or taken from individuals. Please protect both the workers and children as they recover from this tumultuous time. And please grant Prime Minister Jean-Henry Ceant success as he launches investigations into government spending and corruption. In Jesus’ name we pray, amen.